Special Report: Who Can You Trust? Where can you turn for reliable, independent information in these crazy times? The left blames the right. The right blames the left. Their mouthpieces on NBC and Fox follow suit like well-trained canines. Economic info from government "officials" is clearly touched up to look a bit better. The "official" economic numbers are about as official as a magazine cover photo. A majority of the public now knows this. A recent poll by Gallup found that "Americans' distrust in the media hit a new high this year, with 60% saying they have little or no trust in the mass media to report the news fully, accurately, and fairly." 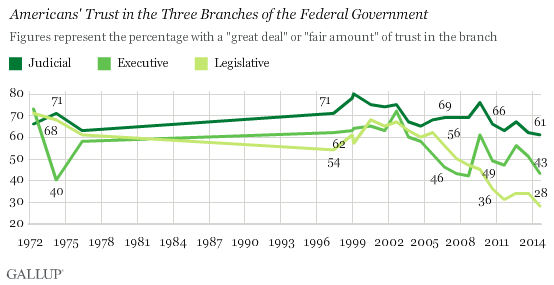 We don't trust the government, either: "... trust in all three branches of the federal government remains on the lower end of what Gallup has measured historically." Saying trust in government has absolutely plummeted would be more accurate. With numbers like that, Americans must be looking for unbiased sources of information. I've made that my mission with a "call it like you see it" approach. But there are a few others out there doing a much better job than me. 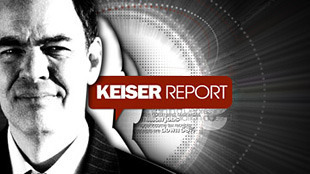 You may have never heard of Max Keiser, but he's the most-watched newsman on the planet. "They" (that media that 60% of the country distrusts) won't let him on TV in this country, probably because he says things like we're in the middle of "a global insurrection. Against banker occupation." During the 2012 election, he said Obama was "a huge disappointment" who "reneged on every one of his campaign promises except one: He did buy his kids a dog." And he was no fan of Romney, either, noting that if the Republican won, America would "simply inherit a different version of the same thing, just as we have done in the U.S. for the past 30 years." Why? Because, according to Keiser, "The guy in the White House is really taking his order from finance." And the current financial industry is what Keiser, like many world citizens, really hates. There is a fury against this global banking fraud that is building every day. People from all kinds of backgrounds, all over the world, have had enough. ... the policy of the banks has been to keep interest rates as low as possible, so as to fuel financial speculation, no matter how oppressive the effect of that would be. Low interest rates wipe out savers and devastate middle-class workers. The banksters have orchestrated this wealth transference of trillions, from the poor to the very wealthy. At the expense of everybody who isn't at the top. I am pro-capitalism and I am pro-free market. But what you have now is not capitalism. It is a state- controlled, command and control, centralised politburo. Both in Britain and the United States. The States is run by the Federal Reserve, an institution that answers only to itself and to a few large banks. It's modelled on the Bank of England. Ben Franklin said that one of the main reasons America revolted was to get away from the Bank of England, the mother of all central banks; the most pernicious and insidious of all. Democracy is not well served by the current political configuration in America. The entire political establishment is designed around enriching a minority of people who have access to both information and capital. Take the CIA. They have recently opened up their services to hedge funds. Hedge-fund managers can now hire CIA agents to do research on pharmaceutical companies, defence contractors, or oil contracts. There is a revolving door for Goldman Sachs guys into and out of U.S. government. And they are working against the sovereign interest of the United States. What's happening is that all these bankers in Europe are consolidating into one major bank that's going to be running Europe, from Brussels. All of that debt will be re-priced in some new European-wide currency. And that bad debt will be joined with all the American bad debt, in some new global reserve bank. And every single step of the way guys like Hank Paulson — who really is a traitor — will put a gun to the head of the American people and say, either you accept this new banking deal or we are going to crash this market. You can catch him daily, talking about "the global propaganda war" and "the banksters," on The Keiser Report. He's broadcast by France 24, Al Jazeera, and Iran's Press TV. But you won't find this patriotic American on any U.S. channels. 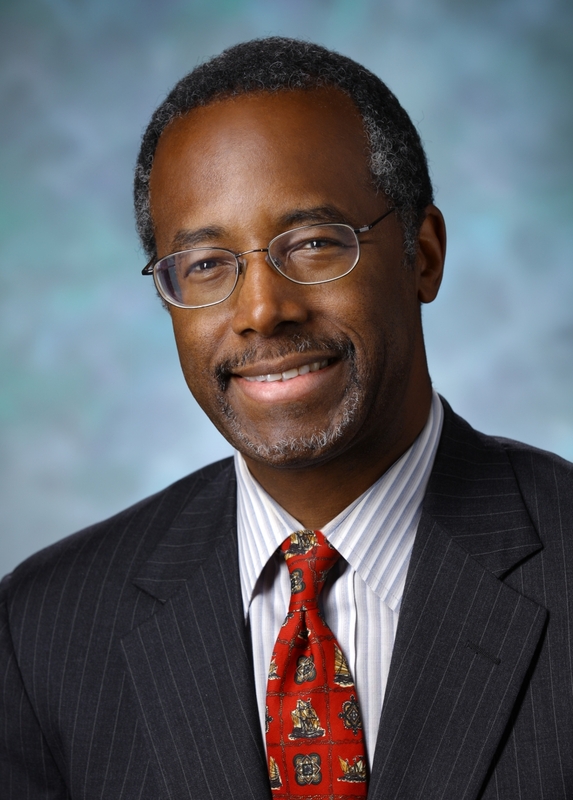 Dr. Carson is a retired neurosurgeon who was awarded the Presidential Medal of Freedom in 2008. He made headlines after he openly and unabashedly criticized America and President Obama — who was seated right next to him — at the 2013 National Prayer Breakfast. Carson has said he is not a member of any political party and, if he were, "it would be called the 'Logic Party'." ... it's not my intention to offend anyone. I have discovered, however, in recent years that it's very difficult to speak to a large group of people these days and not offend someone. The PC police are out in force at all times. And we've reached reach the point where people are afraid to actually talk about what they want to say because somebody might be offended. But PC is dangerous. Because, you see, in this country one of the founding principles was freedom of thought and freedom of expression. And it muffles people. It puts a muzzle on them. And we cannot fall for that trick. And what we need to do is start talking about things, talking about things that are important. ... here we are at a time in the world, the information age, the age of technology, and yet 30% of people who enter high school in this country do not graduate. 44% of people who start a four-year college program do not finish it in four years. What is that about? Think back to a darker time in this our history. Two hundred years ago, when slavery was going on, it was illegal to educate a slave, particularly to teach them to read. Why do you think that was? Because when you educate a man, you liberate a man. We have dumbed things down to that level, and the reason that is so dangerous is because the people who founded this nation said that our system of government was designed for a well-informed and educated populace, and when they become less informed, they become vulnerable. Think about that. That is why education is so vitally important. We need doctors, we needs scientists, engineers. We need all those people involved in government, not just lawyers... I don't have anything against lawyers, but you know, here's the thing about lawyers... I'm sorry, but I got to be truthful... got to be truthful — what do lawyers learn in law school? To win, by hook or by crook. You gotta win, so you got all these Democrat lawyers, and you got all these Republican lawyers, and their sides want to win. We need to get rid of that. What we need to start thinking about is, How do we solve problems? Why is it so important that we educate our people? Because we don't want to go down the pathway as so many pinnacle nations that have preceded us. I think particularly about ancient Rome. Very powerful. Nobody could even challenge them militarily, but what happened to them? They destroyed themselves from within. Moral decay, fiscal irresponsibility. They destroyed themselves. If you don't think that can happen to America, you get out your books and you start reading, but you know, we can fix it. ... one of our big problems right now, and like I said, I'm not politically correct, so I'm sorry, but you know — our deficit is a big problem. Think about it. And our National Debt — $16.5 trillion — you think that's not a lot of money? I'll tell you what! Count one number per second, which you can't even do because once you get to a thousand it will take you longer than a second, but... one number per second. You know how long it would take you to count to 16 trillion? 507,000 years — more than a half a million years to get there. Here's a parable: A family falls on hard times. Dad loses his job, or is demoted to part time work. He has five children. He comes to the five children, he says we're going to have to reduce your allowance. Well, they're not happy about it but — he says, except for John and Susan. They're special. They get to keep their allowance. In fact, we'll give them more. How do you think that's going to go down? Not too well. Same thing happens. Enough said. ... there must be something inherently fair about proportionality. You make $10 billion, you put in a billion. You make $10 you put in $1 — of course, you gotta get rid of the loopholes, but now, now some people say, that's not fair because it doesn't hurt the guy who made $10 billion dollars as much as the guy who made $10. Where does it say you have to hurt the guy? He's just put in a billion in the pot. We don't need to hurt him. It's that kind of thinking — it's that kind of thinking that has resulted in 602 banks in the Cayman Islands. That money needs to be back here, building our infrastructure and creating jobs — and we're smart enough, we're smart enough to figure out how to do that. Dr. Carson was then promptly audited by the IRS. 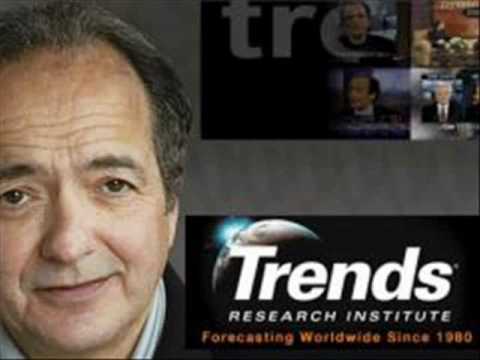 Celente is a trend forecaster and author. He describes himself as a "political atheist" and a "citizen of the world." He correctly forecast the healthy food revolution (in 1993), coining the term "clean food." He called the bottom in gold prices in 2002, when it traded for $275 an ounce... and started sounding the horn for a "gold bull run" in 2004. He also forecast the rise of bottled water and gourmet coffee. His forecasts have grown steadily more dire. Just as the Twin Towers collapsed from the top down, so too will the U.S. economy. When the giant firms fall, they'll crush the man on the street. The economic policies of the U.S. government over the past few years have failed to fix America's fundamental problems and have merely papered over them, and in fact made them worse. By 2012, the "American Empire" is collapsing. The economy is as bad as it was during the Great Depression in many ways. In spite of all this, the U.S. government, power elites, and mainstream media continue to insist that the fundamentals of the world economy are sound, and that official policies can lead to a recovery. A growing number of average people, however, doubt this. Wall Street controls our financial lives; the media manipulates our minds. These systems cannot be changed from within. There is no alternative. Without a revolution, these institutions will bankrupt the country, keep fighting failed wars, start new ones, and hold us in perpetual intellectual subjugation. By 2012, Obama is viewed by most as a stale president who sold himself as a fresh, visionary candidate in 2008 and instead proved to be a servant of the big corporations and the military-industrial complex like his predecessors. His economic policies only delayed disaster and in fact have made the situation worse: Expansionary monetary policy and the various government bailouts and stimulus programs create a "Bailout Bubble" that invariably bursts in a cataclysm for the U.S. and world economy. In 2010, survivalism will go mainstream. Unemployed or fearing it, foreclosed or nearing it, pensions lost and savings gone, all sorts of folks who once believed in the system have lost their faith. Motivated not by worst-case scenario fears but by do-or-die necessity, the new non-believers, unwilling to go under or live on the streets, will devise ingenious stratagems to beat the system, get off the grid (as much as possible), and stay under the radar. His 2002 book, What Zizi Gave Honeyboy: A True Story about Love, Wisdom, and the Soul of America, is one of the reasons I decided to found The Outsider Club. Many of the ideas and topics shared by these men and others are playing out right in front of us. The U.S. government is shutdown, for crying out loud. We're staring straight at default. It won't happen, of course... The financial string-pullers need to keep the stock market party going a bit longer. In a clear glimpse of who really controls things, JP Morgan (which has made around $1 billion from administering food stamp (EBT) cards since 2004) has said it will cover Social Security and Welfare payments if the government goes into default. See, we don't even need the government! JP Morgan's got it covered.